Bhutan in the eastern end of the Himalayas rejoices the intact form of Tibetan Buddhism, the Himalayan architecture in its monasteries and forts and the happy mountain lifestyle. Sparsely populated mountainous kingdom is guarded in north by shimmering Himalayan peaks including Jomulhari and Gangkar Punsum. The lush rolling hills and lakes are fetched by glacial rivers. In the bountiful of nature lived the most gracious and spiritual people of Bhutan. Hidden in the natural stronghold of Himalayas, Bhutan remained aloof from the strife in its neighboring countries. The last existing Shangri-La of Bhutan was just open for foreigners in the 1990es. 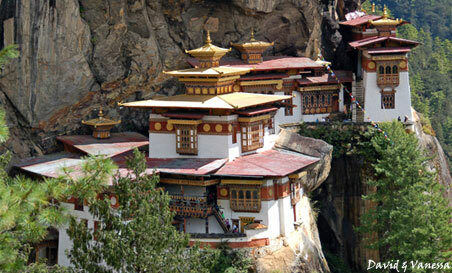 Bhutan walking tour is designed to give you the true insight of the country. The tour is the combination of most scenic and interesting day walks, sightseeing and comfortable stay. The sightseeing of Thimpu, Paro and Punakha is combined with gentle and scenic walks in the outskirt. We will go beyond the city limits and cross high hills, pastures, forests and remote charming villages coming back to the comfort of nearby city. The Bhutan walking tour gives you an opportunity to explore the countryside and enjoy the Himalayan scenery without exhausting multiday trek. The flight to Bhutan is one of the most spectacular Himalayan sightseeing flight. We will enjoy the breath taking views of Mount Everest, Kanchenjunga and other famous Himalayan peaks, including the sacred Mount Chomolhari and Jichu Drake of Bhutan. Upon arrival at Paro airport, our travel represent will receive you and together you will drive to Hotel. After some rest, in the evening your guide will take you to a tiny Paro town for orientation with the place and people. The legendary Taktsang Monastery, which is also called Tiger's nest, perched some 2,000 ft / 600m up on a sheer cliff overlooking the valley, is a popular hiking destination. The return trek to the road head is downhill and takes about a little more the time it has taken you to come up. On the way back, visit a typical Bhutanese village home to have an insight on living style of Bhutanese villagers. Drive back to your hotel in the evening. Take a scenic drive of 1 & ½ hr to Chele La pass at an altitude of approximately 3900m/13000ft with views of Paro Valley on one side and Haa Valley on the other side. Hike up to clustered shelters built on sheer cliffs, under the rock cave and a temple that house some 50 or so nuns. Walk back to meet the transport and drive to Paro and visit Bhutan's national museum, a fascinating place housed in an old watchtower above the huge Paro Dzong. You will also visit Rinphung Dzong. After breakfast, we drive to Thimphu, 2 ½ hrs, the least visited of all the Himalayan capitals. Check in hotel and after some rest; embark on the tour of Thimpu, beginning from a Nunnery on the outskirts of Thimphu. You will then visit the School of Arts and Crafts, Textile Museum, the Heritage Museum, Changgangkha Lhakhang (temple), National Library, Traditional Hospital and traditional paper factory. At the end of the day, we may also pay a visit to the great Tashichho Dzong, seat of Bhutan's administrative and religious centre. Early in the morning, visit the Memorial Chorten, a shrine built in the memory of the late king, Jigme Dorji Wangchuk, where people gather to pray and pay homage. We hike to Cheri Gompa Monastery. This is a pleasant rural walk, gently up a valley through paddy fields and woodland via a Tibetan village. You can enter the courtyard of the Gompa but entrance to the main shrine is not permitted for Non Buddhists. Descend to the bottom of the hill, meet your transport and drive back to Thimpu. This morning, we hike to Chokortse monastery which is situated on a saddle. The walk is all the way uphill 40-50 minutes and passes through blue pine, spruce and rhododendrons. From here, the view of Thimphu valley below is breathtaking. It takes 2 hrs, for the out and back trip. In the afternoon, browse the markets of Thimphu and later drive to Paro for overnight. After breakfast, drive to Punakha, the old winter capital of Bhutan with a Stop at Dhochu La Pass, (10,000ft/3,048m) and appreciate the spectacular views of eastern Himalayas. Check in hotel and in the afternoon, you will make a short trek to visit the Crown Prince's chorten and nearby villages. You return on a different route through the village to Sonagasa (the King’s winter residence) and through to Punakha Dzong, following the Mo chu river. You will meet the vehicle and visit huge impressive Punakha Dzong. After breakfast, hike the legendary Chimi Lakhang, also known as the ‘temple of fertility’. It’s a 20-minute walk leading across rice fields to the tiny settlement of Pana. There are very few monks at the temple, which is surrounded by a row of prayer wheels and some very beautiful slate carvings. Drive 13 km to the town of Wangdue Phodrang. Walk through the clean streets of the town of slate roofed houses and visit the Dzong, the district headquarter. Return to Punakha for overnight. After breakfast, retrace drive the way via Dhochu La where you will stop for a while for the views and refreshment drinks. We will have lunch in Thimphu and drive further 2 hrs to Paro.